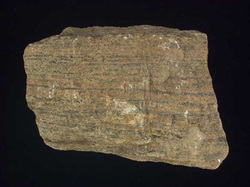 - Sedimentary rock is made from sediment and/or by chemical reactions. - Sediment is loose material, such as bits of rocks, minerals, plants, and animals. - Water, wind, and ice can move sediment to a place where it settles. - Whenever this happens a new layer of sediment forms. - One treasure that can be found in sedimentary rock is fossils. - Sedimentary rocks are usually formed in oceans and lakes where larger, heavier fragments settle first. - Limestone is the most abundant chemical sedimentary rock. - Layers of sedimentary rock are called strata, or beds. These are the most characteristic feature.